The 18 year old midfielder completed his medical today and signed for an undisclosed fee. Harris as awarded the League Two Apprentice of the Year at the Football League awards in April 2011. Wycombe boss Gary Waddock told wwfc.com. "Like Jordon Ibe recently, we didn't want to stand in the way of Kadeem and the opportunity for him to play at a higher level. "I've thoroughly enjoyed working with Kadeem during my time at the club and I wish him every success for the future." 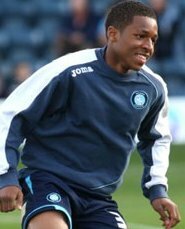 Kadeem has appeared 24 times for Wycombe's first team and helped the club to promotion last season. He will join up with the City squad on Wednesday morning.